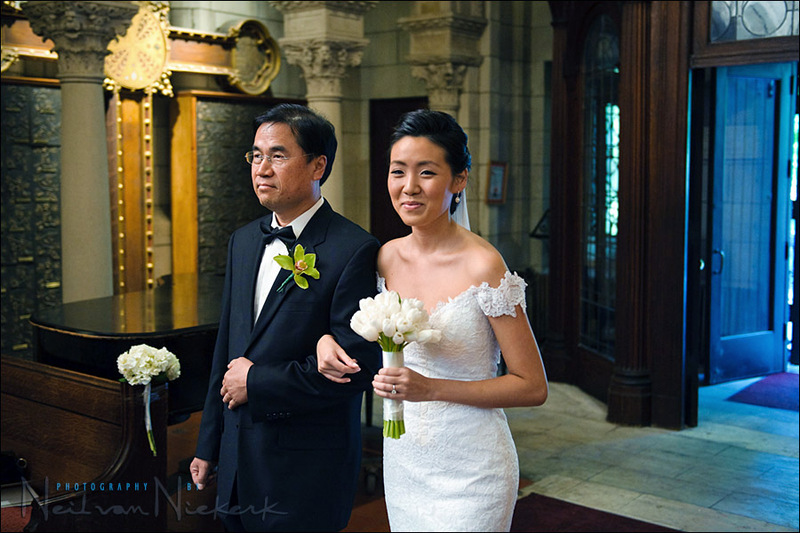 The processional is technically probably the most difficult part of a wedding to shoot and get right. Light levels are low in cavernous churches, while people are walking towards you. Getting enough light on them, and having that light look good, as well as getting the image sharp .. that’s a tall order. 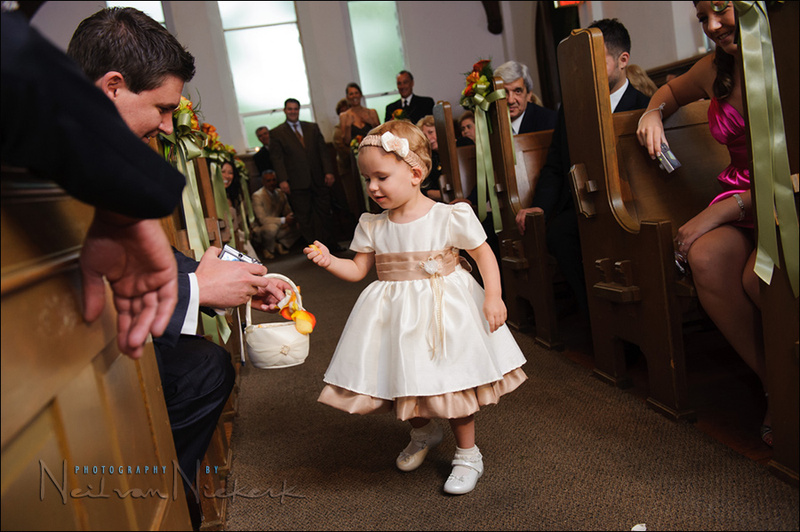 In the photo at the top, the adorable flower girl just had to stop and check in with dad half-way down the aisle. 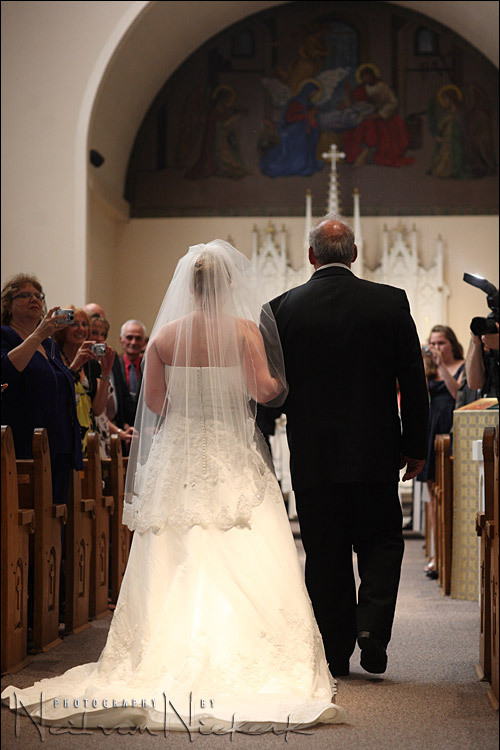 I use on-camera flash to photograph the wedding processional. I always try to find a way to bounce the flash so that the light is soft and flattering. I want the flash to enhance the available light. I nearly always gel the flash for incandescent lighting indoors to make the flash not be as obvious. This way I am adding tungsten light to the tungsten light and the flash therefore blends more easily with the prevailing light. I find my settings so that the available light is about 1 stop (or a little more) under-exposed, and then bounce flash behind me into the church .. but still making sure I have a useful shutter speed. By the way: 1/60th isn’t necessarily a useful starting point. This does mean cranking up the ISO considerably … I’m often somewhere between 1600-3200 ISO, at wide apertures. Therefore a high-ISO capable camera is essential for me to work in what is usually under-lit scenarios. I really really really try my best to stay away from using a diffuser cup of any kind, since this most often just makes for ugly flash photos. But sometimes when the church is simply too large, or has wooden paneling, then I am forced to accept that compromise. Below is the image from my second photographer on that wedding, where you can see me at the very edge of the frame. Well, not quite me, but The Black Foamie Thing – the flash modifier I still prefer to use with processionals. Even though it isn’t an efficient use of the light from the flashgun, I want “pretty light” instead of volumes of light from my flashgun. By bouncing flash into these large places, I use a battery pack to make sure the flash recycles fast enough. This technique would obviously also work for the second processional. Apparently that is the correct phrase: “second processional”. 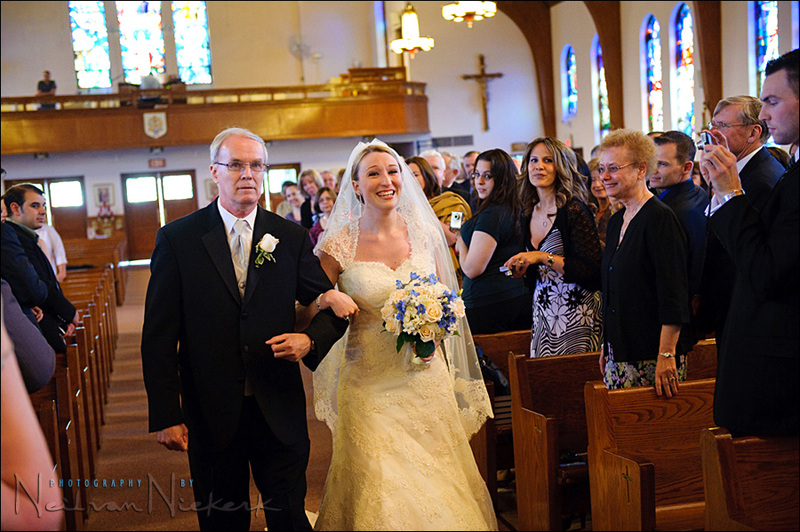 Not the “recessional”, as I was once corrected by a priest when I talked about the recessional. It’s the second processional. Now you know. 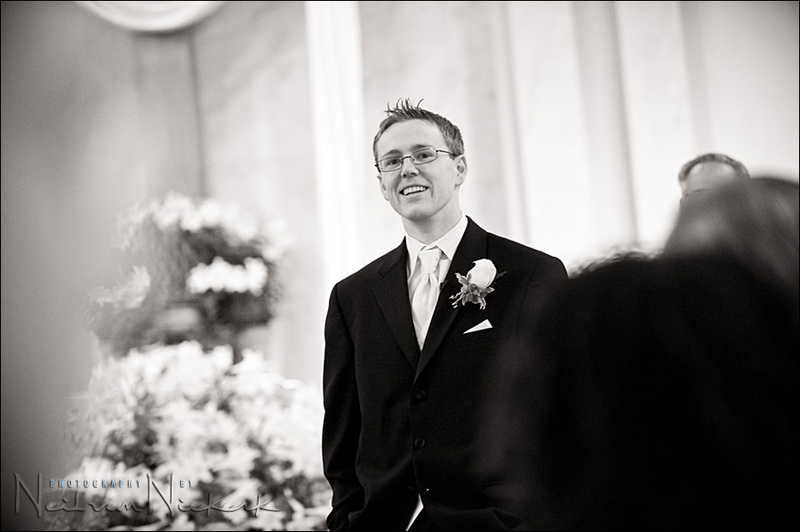 The ideal is to have a photo of the groom’s expression as the bride comes down the aisle. So do swing around at some point to grab a shot of the groom watching his bride walk towards him. Just to make sure I have this type of photograph, I do take a shot or two the groom just before the bride comes down the aisle. You have such a limited time-frame, and you could be up against wedding guests stepping into the aisle, or family members with iPads, that it is too unpredictable to rely purely on the authentic moment happening for your camera. 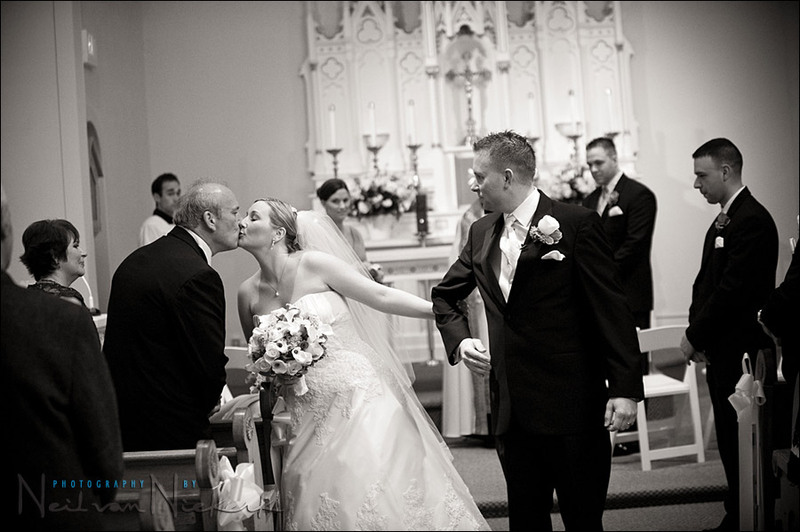 So there is my approach to photographing the processional. No specific settings that I could advise to be used, but rather a range of settings. I really much more prefer a natural look to the lighting, but with the light being “open” rather than the top-heavy light you usually find in a church. I therefore use my flash to augment the light in the church .. and for that, I need high ISOs and wide apertures and a sensible shutter speed. I really appreciate your efforts in Planet Neil, and your generosity in sharing your knowledge of photography. I follow several very good photographers on the web, but your photos always show the best lighting, exposure and naturalness. You know Neil, I am quite relieved to read this. I only recently got my 580 EX II and I am still learning how to use it. I would also like to be able to shoot natural light because that is what I’ve had to make do with. However on many occasions the high ISO and wide aperture have not been able to cut it. For a while there, I was thinking that I would just have to accept getting used to flahsing everything, but it’s good to learn about your tread-lightly technique. I wonder how does it look like, when you bounce the flash behind you. Does it mean you aim the flash toward the opposite direction? I point my flash towards the direction that I want my light to come from. In the same way that in a studio you’d figure out where you want to place your softbox, you would now decide where you want your light to come from. And that is the direction I bounce my flash towards. I very very very rarely “bounce my flash forward” in that 45′ or 60′ position, since this is very much still direct flash, and will look like it. Do you find more and more that some of your photographs have to be binned due harsh direct flash light from the guests compacts being captured in your photographs? David .. I do find that there are a few images at each wedding where I can clearly see a guest’s flash go off. Usually not a problem, and quite often fixable in RAW. But sometimes, you can get really lucky with the effect. Here’s a photo that my friend Josh Lynn took when he 2nd shot a wedding with me last year, and a guest’s flash went off at the same time. Per the previous post and the photo you posted with your camera on the right, there definately are a bunch of uncle bobs there! Looks like your second shooter even caught your flash. Once again, your methods of photographing as well as teaching are fabulous!!! I greatly appreciate this one in particular, as I’ve recently had some VERY dark churches and was not happy with the outcome. I would also like to ask you, what do YOU do to nail that focus? It all seems to happen so quick, and I despise the hit and miss that seems to come with continuous mode. Care you share your tips and tricks? What do I do to nail the focus? But I do take more than 1 image. I often fire off 2 or 3 or even 4 shots of each bridesmaid as they walk down the aisle. Even though this is rapid-fire photography, the flash isn’t noticed and not intrusive since I bounce it behind me. Not every image will be crisply in focus, simply because of the tough scenario .. low light + people moving towards you. And they are often low-contrast subjects, ie, black tuxes or even-colored dresses. So by shooting a number of frames, I increase the likelihood of getting at least one image sharp. The pro body is essential. The fast-focusing lens is essential. I mainly just use the center AF point to focus, or one of the cross-type sensors close to the center. Mostly, it is the equipment here that enables me. You know how people will say it is the photographer and not the equipment? They are lying to you. The choice of equipment is very important in the scheme of things. Thank you for the tip! This is the most difficult moment to photograph in the wedding. I am going to practice this, including the battery pack for the Canon 580EXII for fast recycling. I was the third shooter (not good enough to be a second or got paid) in a wedding several weeks ago using the techniques that I learned from your class and this site. Results were pretty good BUT quite a few of my pictures were ruined by Uncle Bob’s flash AF (auto focus) IR light on my subject’s face. Any suggestion? Ben .. there’s no way out of that one except to shoot faster and shoot more, and thereby giving yourself that statistical greater chance of having at least one shot that works. I wonder though if there is a Photoshop technique to get rid of those red patterns? I’ll have to check. Many thanks for showing what most other tutors do not show. I have juggled with the same parameters, but never tried a tungsten gel. As Amy asked above, how do you get such spot on focus ? Once again, a great post, congratulations. My question is: since you work with very large apertures, you end up with a very shallow DOF, producing great blurring effects in the backgrounds, but risking your focus. How do you manage your focusing points in a situation like the processional? Are you all nervous jiggling around with the camera dial? I usually am. No nerves. ;) I know my camera. It might sound silly or even strangely boastful, but I do know my cameras. You have to to be able to shoot fast and instinctively. A long time ago I read a column in a magazine .. if I recall correctly, the article was written by well-known photographer-author Steve Sint .. where he discussed how familiar you should be with your camera. He mentioned war photographers who would train by running blindfolded, loading their 35mm cameras with film as they ran. My reaction was along the lines of, “woah! ?” .. and then it sank in with me. You do have to know your camera that well, regardless of what kind of photography you do. So I do spend idle moments (like waiting in the car and such), just playing with the controls, and getting a feel for their placement. Counting the clicks for the settings. Feeling where the ISO button is. And so on. You really do have to know your camera. So specific to your question. With the D3 I have set the center button of the multi-selector such that it will return me to the center AF point when I press it. So that way, no matter which AF point I might be at, I can return to the center without even looking at the screen. And then I can even set one of the off-center AF points without even looking at the viewfinder. When I shot with the 1D mkIII, I similarly decided to only enable the 19 cross-type AF sensors (instead of all 45) .. and with the processional, I only used three horizontal AF points – center, and the one on either side of the center. So I kept my choices simple with the 1D mkIII when I did something which required concentration .. and that way I wouldn’t risk getting fumble fingered. An important consideration for me here is that my main bodies be exactly the same camera. I now shoot with two D3 bodies (and might get a D700 for back-up, or perhaps wait for the follow-up to the D700). I had a D700 and a D3 at one point, but just in how the placement of their ISO and WB buttons differed, I decided to sell my D700 and get another D3. I couldn’t risk getting confused in crucial moments. Similarly, I shot with three 1D mkIII bodies. I sold my 5D and replaced it with another 1D mkIII so that I didn’t have to “think” about my camera, but could allow myself instead to go to a kind of “auto-pilot” way of shooting with the controls falling naturally under my fingers, no matter which camera I picked up. I can’t afford to “think” about my camera and its controls while I am shooting. Very good question! I hope Neil can give us an insight to his focusing methods in these situations. Reading some of the recent comments, and although Neil may have a few tips on focus, there is one primary advantage he has over most people. He used the Nikon D3X. Top of the line pro camera (probably the best one out there right now) that has many focus points and algorhithms that work better at detecting the face or subject than other cameras. The ISO and image quality of that camera is absolutely remarkable but does come at a price few of us can afford. Jeff .. actually, the D3. But your point is absolutely valid. As I mentioned in the article, is that the technique here is reliant on using a camera with superb high-ISO performance and AF capabilities. It’s something I’ve mentioned several times on these pages already .. my hefty reaction against the silly comment that it is the photographer, and not the equipment that matters .. when the equipment clearly is of crucial importance for certain types of photography or certain styles of photography. However, I don’t think these tools are out of reach of the aspiring professional photographer. A used Canon 5D is probably your best camera right now in terms of quality-for-cost. At the same time, a new (or used) Nikon D700 or Canon 5D mkII isn’t that far out of reach for most photographers that want to shoot professionally, or deliver top quality results. Beautiful photographs! Would you change your approach if the “second processional” is strongly backlit (huge window in assembly hall)? Gretje .. most likely I would approach it the same, and let the outside areas (windows) just blow out. But it would depend on the situation really. I have a newbie question about high-iso capable cameras. Right now, I use an amateur camera (Canon Rebel XT), and I’m thinking of upgrading if only because the noise level on my camera at 1600 iso is nearly unbearable. Am I correct in thinking that on higher-end or professional cameras there is much less noise at the same iso level? David, in short, yes. The pro-spec cameras tend to have better noise performance than entry-level cameras. Regarding the rebel, it is a wonderful camera and can take many great photos as I used to have one myself. When using high iso, please remember that correct exposure make a huge difference in acceptable noise levels. Aside from that however, and I am sure someone with a statistical analysis will correct me, but from visual observation, here is my run down on it for the current models of canon. The rebel shooting at iso 200 would probably be the same as a 40d or 50d shooting at iso 400, while the 5d and 1d series you could shoot at around iso 1000 compared to the rebels iso 100 and get similar noise. So yes, the pro models have a distinct advantage in iso performance. The Nikon D3X has far better iso abilities than the canon 1d at this time, but looking forward to the release of the 1d mark IV or whatever they call it as I would bet the iso capabilities will be astonishing. These however are only opinions based on visual observation as me and some friends actually tested out some shots and compared. So no scientific research, but I did quickly upgrade my rebel when I started shooting low light situations as I was disapointed with it as well along with some other reasons. I also have a frind that shoots for a pro sports team and he just sold a couple hundred grand worth canon gear to move to the Nikon D3X for the sole purpose of better iso capabilities. Long and short still, it is the user than makes the shot, not the camera, even with the abilities of the pro camera they still need direction such as where to focus, but with the auto focus you do have better luck at nailing your intended target. Ok, getting off topic here as the discussion is about the processional, not iso performance. I am also guessing that in an attempt to answer the last question about how to do it in the old days, was just to either suffer with the noise or deal with the flash look. In the film days, it seems that film grain was always better looking than the iso noise we have today. Would you gel for fluorescent if that were the main light source in a venue? Butch .. so far I have just resorted to over-powering fluorescent lighting with flash and be rid of greenish color casts. That said, it would appear that fluorescent lights have come a long way from the ugly industrial lighting that we often associate with fluorescent light. Check this recent post where I thought I was surprised at how good high-quality fluorescent light actually can be. So how was it done before??? Well, the thing is, these cameras weren’t always around. So what would you have done differently in the days of say the Nikon D1 or D2x (which wasn’t known for great output above ISO800) and the SB-800 flash? How did photogs/you manage before the super-duper cams you mentioned and Canon 35mm DSLRs? Please note, this is not a rude or rhetorical question; I really wanna learn. Previously, my photographs had a more distinctly flashy look to it. Out of necessity (dark churches), and lack of cameras that could deal with this. That is why I love this generation of cameras so much .. they really allow you to adapt and even change your style. Hello Neil, when I see those high ISO’s one thing comes to mind….GRAIN. I guess like mentioned above, proper exposure is key but also notice the FStops…you need a fast lense correct. Was this TTL or Manual.??? I don’t see much noise at 2500 ISO. You also have to keep in mind the final use of the image .. for a wedding album. Already, with 12 megapixels I am downsizing for album panoramas .. and a photo like that might be used as maybe around a 5×7 size image. Not only that, but noise prints differently than you see it on your screen. So I can near guarantee you that with that image, you will not see noise when printed in an album. And that is even without any noise reduction applied to it, other than the default setting in ACR. With the right cameras, high-ISO noise just isn’t much of an issue any more. When you say you bounce your flash over your shoulder into the church, what are you bouncing the flash off of? Robert, if you look at that photo of the bride from behind, you’ll see what I am bouncing my flash into .. just in the general direction I want my light to come from. It does seem incredible, but at some point where you have a suitable aperture and ISO combination, you can get surprising results. Key here is that the flash doesn’t completely dominate as the main light source, but instead is “riding on top of” the available light. as well as this previous post. In both those examples, the flash exposure is riding on top of the ambient exposure which is perhaps a stop (or maybe more) under-exposed. The TTL flash then takes care of the rest … as long as the attempt is realistic. Your flashgun only has so many electrons that it can turn into photons. I do zoom my flash-head now for more efficient light from my flashgun. Many thanks for all the tips, invaluable stuff. You said you fire off several shots fast during the recessional- I think think with an SB-800 the recycle time is a couple of seconds, so when I do this I get one correct exposure and a couple of dark frames. 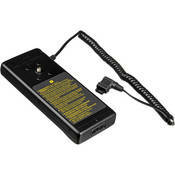 Are you therefore using an external battery pack such as the slim Quantum one, to recharge the flash? I only looked through this post so apologies if I missed this elsewhere on the site. A battery pack is essential for this. You need a fast recycling time. With my Nikon’s I use the Nikon SD-9 battery pack. I fold the flaps on the pouch over my camera strap, and that way attach it to my camera. I use NiMH rechargeables with these. (You can see the charger and brand of batteries on this page). With Canon I used (and would recommend) the Canon CP-E4 battery pack, and I clip this onto the camera strap as well. For more juice than the battery packs with rechargeable batteries, I use the Quantum Turbo SC battery pack – (SC = Slim & Compact) . 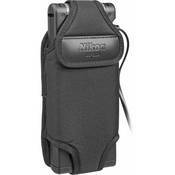 As the name says, it is slim and compact – yet offers great capacity. The advantage of the Nikon SD-8A and Canon CP-E3 over the Turbo SC, is that by clipping the much lighter battery pack to the camera strap, it leaves the camera bodies independent of me. That makes the cameras easier to set down, or switch them to the other shoulder. Another advantage over the smaller battery packs by Nikon and Canon, is that they won’t damage your speedlight when you rapidly fire your flash. The Quantum has the potential of doing that if you’re not careful. Sorry Neil, one more question. Mark, my own (strong) preference is to not use Auto ISO because it introduced another level of automation for me to have to second guess. I really want my camera settings to be what I tell them to be … and then add flash to that, whether manual flash or TTL flash. Other photographers use Auto ISO with great success though. kinda off-topic….but you mentioned above ‘down-sizing’ for the wedding album. not sure if I’m taking it the right way but i’ve been wondering if it’s completely necessary to use full resolution/sized files for images in an album especially when they are only going to to be the equivalent of 4×6 or smaller on each page???? i, for example, use BayPhoto and their ROES order system and uploading all those full resolution images can take quite a long time. do you have a standard that you downsize to? Brett .. the labs do usually upload a smaller version of the file. For an album, I don’t down-size at all. I use Fotofusion Lumapix to design my albums, and the program references the images that you use in the design, and only at the output stage re-size the images. The software does it for me. I have to correct myself in my previous claim that even for a panoramic spread, I have to downsize. I meant for an album page, not a spread. What I was referring to is an album, let’s say 11×11 printed at 240 dpi. And if I chose 300 dpi / ppi .. then I would have to uprez slightly. Neil, in Single AF mode, you can only use one focus point as your target. So what do you mean by one of the “cross-type sensors close to the center”? Are you talking about moving your focus point within a 51, 21, 9 sensor area (that is configurable in camera) or something else? Love your site! I want to make sure I’m understanding your technique here…you are pointing your flash the opposite direction from your subject to bounce the light? What if the church has high ceilings? How far is your subject away from you? 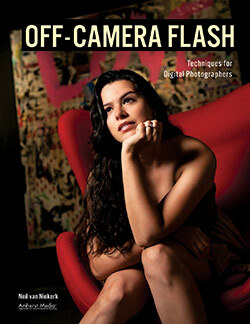 Because your flash is not shooting toward your subject, are you increasing your power on the flash? George, that’s correct. I usually bounce my flash into the direction that I want my light to come from. This usually means I don’t bounce “into” my subject, unless I am flagging my flash. With TTL flash, in theory, you should not have to adjust your flash power when your subject is further away, since the camera and flash takes this into account when calculating exposure. A quick question about autofocus…with the processional are you using a servo type or single shot? This choice has often driven me crazy. I’m using a Canon setup. Luca .. in low light like this, I rely on the AF assist beam, which only works in Single Shot mode. There is however now the risk of the camera not locking on, or locking too slowly on the moving subject. This all adds up to what really is, in my opinion, technically the toughest part of the wedding day. Neil, you said “I now shoot with two D3 bodies (and might get a D700 for back-up, or perhaps wait for the follow-up to the D700). I was thing about getting a D700 but do you think that their will a follow-up for the D700 soon? If so I will wait. I have no news about any upcoming releases, but this is technology after all … and new releases are what keeps the machine alive. So there will inevitably be an update to the D700 in one form or another. 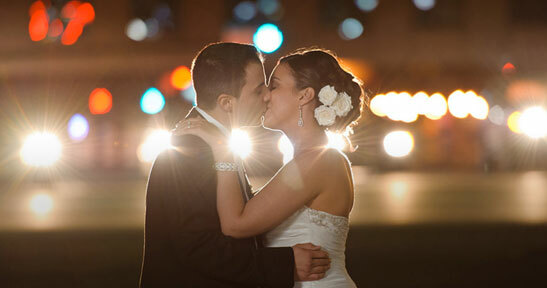 I am in the process of gathering information to purchase a set of equipment for wedding photography. I would like your opinion on my battery pack, flash and flash bracket decision. I will purchase a Canon 5D mark ii and 24-70 mm f2.8L lens. I wan to buy flash 580 EX II but some one suggested me to go with a Quantum QFlash Trio. What flash would you recommend? I also want to purchase a batter pack, Quantum Turbo 2×2, but I am not sure I can connect the camera to the flash? Would the pack be able to power both the camera and the flash for a whole day of taking picture? Would you recommend to have a flash bracket? I don’t own the Trio although I would like to test one out. In my experience with the T2 and T2D and T%D-R, the Canon and Nikon speedlights are capable of far more subtle results. So I wouldn’t immediately recommend the Q-flash for an on-camera flash. But, as I said, my experience with the Trio is non-existent. Re battery packs, yes you can connect a Quantum pack to your battery, especially if you want faster recycling. Mostly though, I get by with the camera manufacturers’ battery packs. They don’t recharge quite as fast as the Quantum 2×2 (although this might in fact be a plus point). What I prefer about the CP-E4 / SD-9 battery packs, is that I can attach those to my camera strap and then free myself from a cable to a battery pack on my belt. Re flash brackets … I wouldn’t dissuade you from getting one, but I don’t use one currently, and don’t often feel like I actually needed one. Could you give us an approximate flash head angle (degrees up and sideways) of the picture above where your camera is visible? To me it looks like your flash is pointing forward (and a little bit upwards) but that would seem to contradict your practice. Is it possibly closer to 45 deg right and 30 up? Les, my flash is usually bouncing off to the side, and over my shoulder. So the actual degree angles … 30-45′ up, and about at 4 to 5 o’clock or 7 to 8 o’clock. I very rarely bounce flash forward like that as you mention. I should perhaps add something like this in a video clip sometime for a future blog post here. 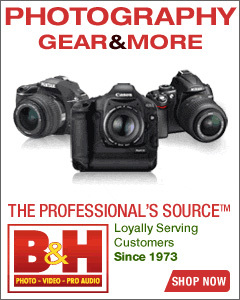 If you’re interested in Nikon technology trends, head over to Thom Hogan’s website, bythom.com. He is a Nikon professional photographer that keeps track of Nikon trends and releases. Thom Hogan is definitely the go-to guy when it comes to Nikon. Am I allowed to translate your work into Vietnamese? Please let me know my limits. Chieu .. You’re more than welcome to do that. I’d be honored. I can even host the web pages as part of the site. Thanks for the great advice on how to photograph the processional as it seems like a more difficult part of the ceremony to photograph. Do you use 2 D3 bodies with different lenses on them for a wedding so you don’t have to switch lenses? I’m just trying to figure out what I should do as I have to photograph my 2nd wedding soon and am wanting to know which lenses are best for what parts of the ceremony. I’ll be shooting with just the one body. Would you normally just switch between using a standard zoom lens and telephoto zoom lens? 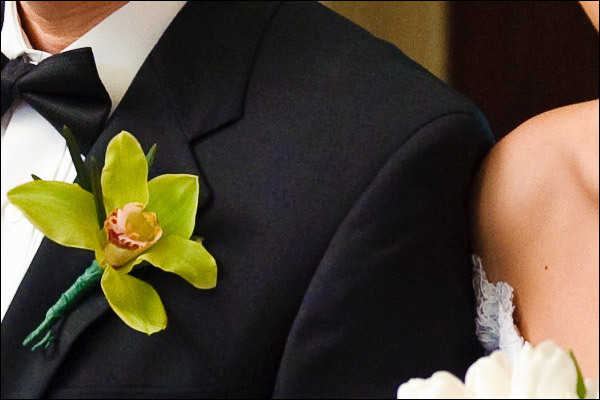 Would you ever use something like the 50mm f/1.4, or 105VR during a ceremony? Andrew, I don’t like changing lenses. So I have two D3 bodies. The 24-70mm f2.8 stays permanently on the one body, and the other body mainly has the 70-200mm f2.8 AF-S VR lens on it. For the ceremony, this is usually enough. But I sometimes bring out the 14-24mm f2.8 if I need a really expansive view from the back of the church. I use the 50mm f1.4 mainly for detail images during the reception, and the 105mm VR for other detail images. I currently have a D300 & D700. 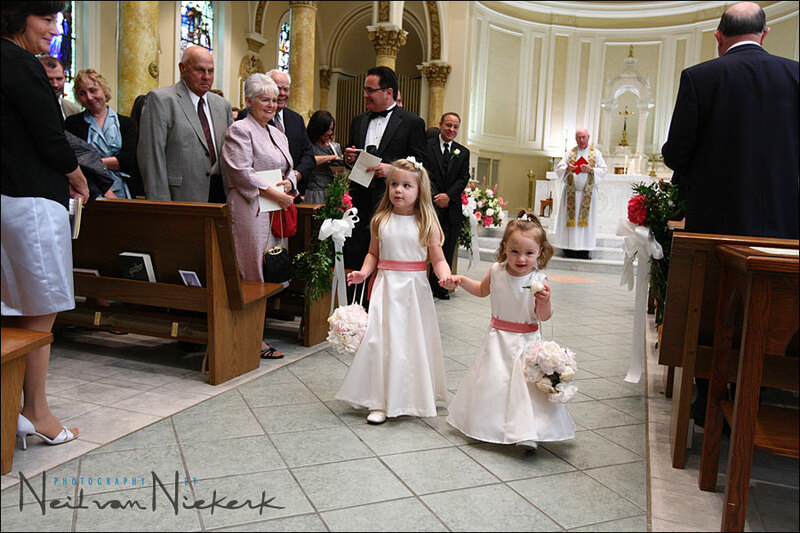 Since I only like to use the D700 at high iso’s and am shooting in an extra dark church soon (will probably shoot at 3200 instead of my typical 800-2000 iso during ceremony)… I am wondering if I should rent a second D700, or should I rent a D3 instead? Would the D3 require much getting used to ahead of time or are the controls very similar to the D700? Lisa, the only immediate difference between the Nikon D3 and D700 in terms of layout and handling, is that the ISO and WB buttons are positioned in different places. So it’s no adjustment to go from the D300 to the D700. The reason why I went with a D3 + D700 combination originally ..
so that the beefier AF of the D3 would drive the AF of the Nikon 85mm f1.4 better / faster than the D700 could. The difference in where the ISO and WB buttons where places, meant I had to think about the camera controls while shooting. I’d rather just that finger memory takes care of that. Neil, let me add my name to those that are thankful to have found this site. My thinking has changed so much that my struggle now is to discern when NOT to use flash. I have two questions if you don’t mind. One, when you say you zoom your flash now, do you zoom all the way in (say 85mm? ), or do you change the zoom with the situation? Also, given the fast paced nature of the processional, when do you determine your FEC? Do you take some test shots before people start walking and quickly dial it in at that point? Thanks in advance. By the way, just ordered the book and am very much looking forward to reading it. Brian .. thanks! When I zoom my flash-head, I zoom it out all the way. Since I am then bouncing flash, the large area that I will be bouncing off, will mean the light is softer. But zooming the flash-head definitely increases the efficiency of the flash. Regarding FEC for the processional – this is something I do while waiting for the parents to come down the aisle first before the bridesmaids. So I always have a few random photos of the guests in the first few rows as I test my flash’s range, and get an approximate setting for FEC, and get my camera settings. Regarding your response Brian S.’s post, what does the SB-900’s zoom range do the light of the flash? At 200mm, is the light brighter or “narrower?” At 17mm, is the light “wider?” The default behavior of the SB-900 is to match its zoom length with the lens focal length on the camera, so what does it mean to override this? I noticed that my lens can be at 100mm, but I can override the SB-900 to be at 35mm zoom. Regarding using 2 bodies, do you have a flash attached to both bodies at all times, only on one body, or do you move it back and forth? I used this bounce technique whenever possible. When the walls are green or too high I use the lumiquest promax system, which works much better than the sto-fen omnibounce, I think. Rebecca .. 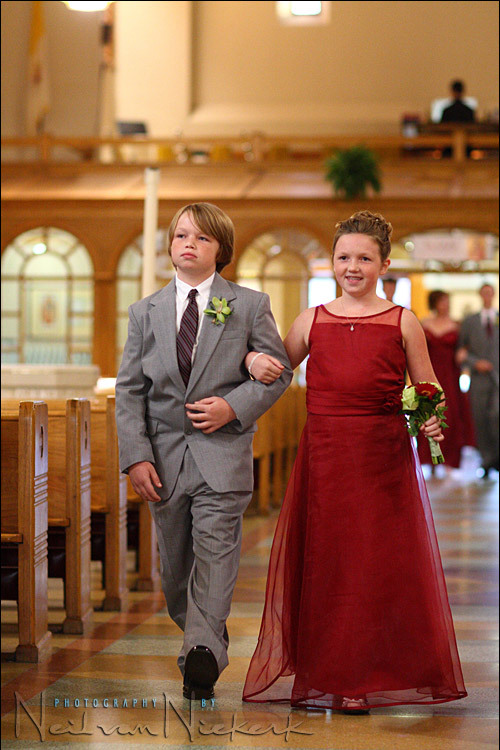 I use two bodies when I photograph weddings. Both are full-frame. The one carries the 24-70m f2.8 and the other the 70-200mm f2.8 .. and both bodies have a speedlight with battery pack on them. The church ceremony isn’t a time to start swapping flashguns around. It’s just simpler for each body to have a flash. Besides … I need the back-up of a 2nd body and flash with me. When you gel your flash, do you set your WB to one of the preset mode or do you use Kelvin? Also when you shooting at high ISO 1600 or above, how much power are you pumping out of your SB900 or SB800 and is your flash set to TTL or manual? Btw, I’m very jealous of your work and knowledge ? You have been a great help! Thank you so much! Brian .. I set my WB to whatever my predominant light source is. For example, if I am using a 1/2 CTS gel, and flash dominates, then my WB will be set to either 3700K or 3850K. But I still adjust it as part of my raw workflow afterward. Hi Neil. 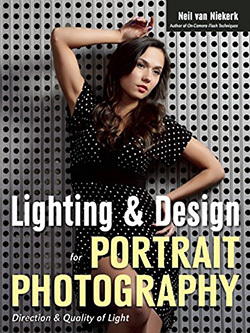 Your blog is very informational and am loving all of the lighting tips. I am an employee for a photography company here in Las Vegas that shoots weddings for a couple of high end casinos. It’s kind of of run and gun. Weddings take 10 minutes or so and I am only allowed to take pictures from 3 different spots in the chapel. I absolutely despise harsh flash photography and try to bounce whenever I can. However I am having some difficulty in getting the look I want (natural as possible). Unfortunately, I am using a Nikon d70s, sb800 speedflash, 18-70mm 3.5-5.6 lens and strobobracket. I say unfortunately because I am not sure with the equipment used I will be able to get the results I am looking for. The first photo of the couple is bounced straight up and diffuses well (we are not allowed any post process work and do not shoot RAW so the wite balance is off). The second photo below is from the rear of the chapel and I cannot move in closer unless I zoom of course, which I do. Horrible flash lighting! Not natural at all. Any suggestions? Just a side note. This is NOT the type of photography I shoot when I am contracted for a wedding on my own. However, I still would like to put out a good final product for the bride and groom. Any critique or help would be appreciated. Keep up the good work. Mark .. the limitation there is largely in the equipment you’ve been given. An f5.6 zoom lens isn’t ideal for flattering flash photography indoors, especially when you aren’t able to push the ISO higher. The 1st photo of the couple is typical of flash being bounced upwards – the lighting is top-heavy and there are shadows under their eyes. Best results would be in bouncing flash behind you if you can, or alternately settle for a diffuser cup on the flash to spread the light more evenly. Also, that photo is under-exposed. You need to push the FEC up a touch to compensate for all the white areas in the scene as the camera sees it. The 2nd photo is once again hampered by the equipment you have. What is the highest ISO that you’re allowed to use? The best compromise here (wrt to the equipment you have at your disposal), would still be with a diffuser cup of some kind. Best of luck there … you have some real restrictions imposed on you. 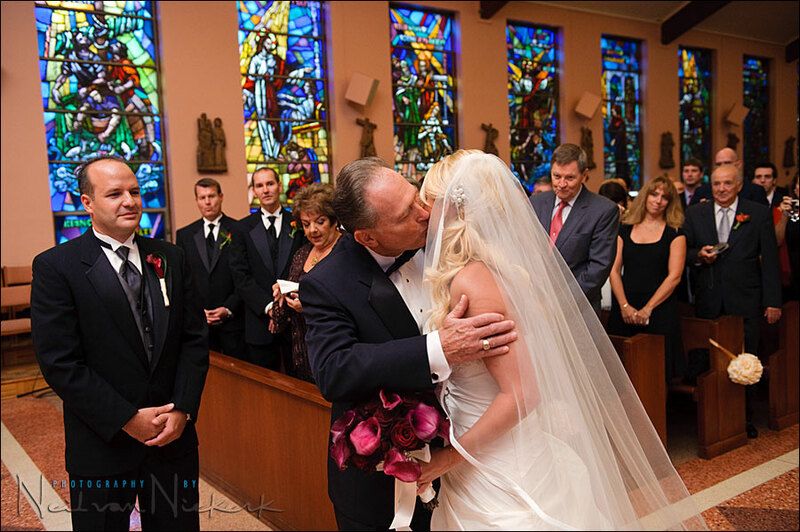 … just wanted to say great work … loved the lighting as well on the father giving away his daughter … did you use a diffuser on your SB? David commented on this image on my other blog, but I thought it best to reply to it here, since this page is where I described the exact technique I used here. My camera settings were: 1/125th @ f3.5 @ 1600 ISO .. flash set to TTL mode. I bounce flash behind me, flagging the flash a bit with the black foamie thing. First, thank you for all your dedication to improving the skills of your fellow photographers. Your efforts are very much appreciated. My question is about what you do when prohibited from using flash during the processional or ceremony? Is there anything we can do to improve the quality of our images during what is certainly one of the most difficult shooting scenarios. Corey .. if you’re not allowed to use flash during the ceremony, then your obvious and only recourse then are fast lenses, and high-ISO capable cameras. You really need the f1.4 primes and f2.8 stabilized zooms then. In my opinion, these are essential to wedding photography. There is only so much one can achieve with an f4-f5.6 zoom lens, especially when coupled with a lower-end camera. 1. 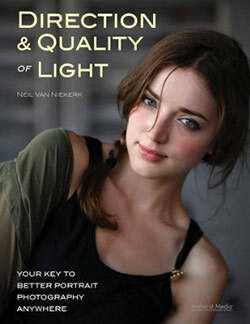 You meter for ambient light and underexpose by a stop? 2. How do you know how much power to dial in on the flash if you don’t have a subject to test on? Every church is different and bouncing your flash would give you different results? Do you rely on TTL to take care of the flash exposure? I know you like to adjust your flash power constantly … I can’t figure out what your procedure is for setting up the shot before the bride comes in. I greatly appreciate your work! 1. your approach here is a correct one. And you have to read that correctly. It is a correct approach. There are other ways of doing this. Also, depending on the situation, you might just use fill-flash. Or no flash. It varies. But the approach you mention there would certainly work. But, as always, one should not be dogmatic about this, but adapt. 2. Usually, TTL flash will give you (what it deems to be) correct exposure. As long as you’re within range of the flashgun’s capabilities of course. So if your flash exposure looks under or over on a test shot or two, then you’d adjust your FEC. 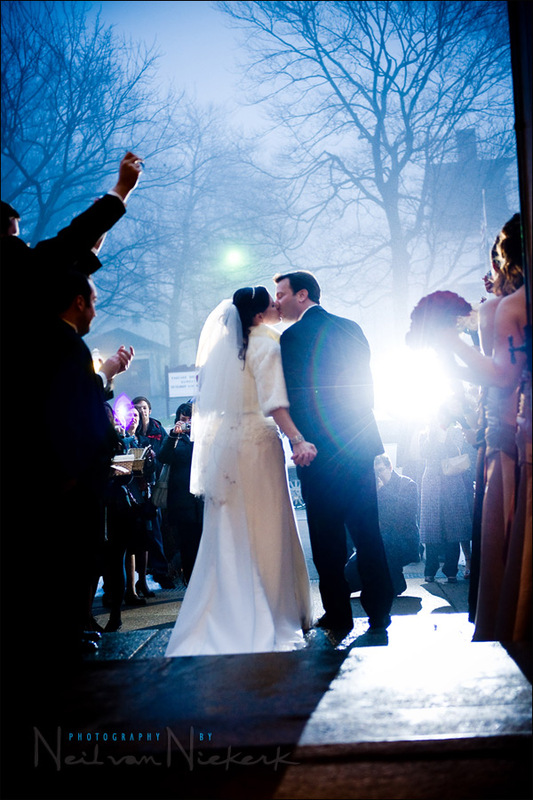 You can easily figure out your flash exposure before the bride arrives. There should be guests sitting in the front rows at approximately the distances the bride will be in her closest approach down the aisle. I did some testing in a very big church with high ceilings. The walls were close enough to bounce I think – about 20ft away from me. I have a D700, sb800 and I was using 28-70, f2.8. I tested the black foamie thing and all of the shots (except a couple when the subject was very close) were under exposed about a stop. I saw this in the histogram and would increase FEC up to +3 at times but still no consistent results. I realize now that I was shooting at iso 1000 or 1600 and a lot of yours are iso 2000 – 2500. I wonder if I wasn’t letting in enough ambient light. As I recall, the ambient was more than 1 stop under exposed. Is that why the flash wasn’t exposing properly? More flash power or ambient light was needed? Many shots were iso 1000 or 1600, f3.2, 1/100th. I remember looking at the meter and the ambient being underexposed more than a stop (more like 2). Should I have increased the iso to 2500? I have a hang up of feeling safe under-exposing the ambient by 2 stops to freeze action with the flash. 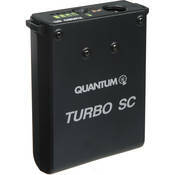 Quantum Instruments -Turbo Battery with 120 / 240VAC Charger and at $389, I told him that was too much. He then recommended Quantum Instruments, Battery 1 Plus Battery Pack (6V) for $214 plus cable. Do I really need all of that power to shoot the way you do? I love your work! The sales guy said the Nikon, SD-8A Battery Pack at $150 isn’t enough power to shoot weddings. What would you do because what you do is working! Thanks so much for all of you help! I do change my aperture as the bride comes closer. I might start off at f2.8 and the dial the aperture 2 or 3 clicks as she comes closer. Also, I peel away the piece of black foam to suit the situation. And I shape it. So it is quite possible that you had it positioned so that it was eating up a lot of the output from your flash. You also need to zoom your flash-head to maximum. In terms of stopping motion .. what was your shutter speed? For the church, I do swap over to my Quantum SC batteries so that my flash recycles faster than it would with the SD-9. The SD-8A is slower than this. So that could’ve been a problem too. Shooting like this does mean your flash is mostly working at (or close to) maximum output anyway. So it is working hard. THanks for your quick reply. I’m kicking myself I didn’t wait longer to get your reply because now I’m in a predicament. I was anxious to order a battery pack so it would get here by the weekend (I’m helping at a wedding) and ordered the SD-8 based on an earlier post of yours..
“Re battery packs, yes you can connect a Quantum pack to your battery, especially if you want faster recycling. Mostly though, I get by with the camera manufacturers’ battery packs. They don’t recharge quite as fast as the Quantum 2×2 (although this might in fact be a plus point). Now that you say for the church, you swap over to the Quantum SC batteries, I’m wondering if I purchased the wrong thing. I really value your opinion bc I am striving to have nice images like yours so could you please tell me if I should keep the SD-8 or return it and order the Quantum today? I can pay for rush delivery for it to get here by the weekend. The last thing I want to do is buy the wrong piece of equipment bc I’ve done that way too many times and wasted my money. If I should get a Quantum, which one? Of those three, I’d say the SD-9 is the best value for money, and the Must Have option of the three. Since the SD-8 takes 6 batteries instead of 8 like the SD-9, the recycle time is slower. And it doesn’t last as long. Even though the Quantum SC might be a better (but spendy) choice then, I’d still say keep the SD-8. It’s small and light-weight. Re the Quantum SC, I also clip this onto the camera’s strap, thereby releasing myself from carrying the battery pack on my belt. I see why it’s a tough call. I will keep the SD-8 then. At least it’s better than having no battery pack. And when I start raking in the dough with all the wedding gigs I plan to book (crossing fingers and praying now), I can buy a Quantum. There will be times I will need the SD-8 even after I own a Quantum right? You’re awesome for being so helpful! I have read what you’ve written on this blog about how you take your photos in the processional, the formal and the reception, but I have not seen anything that tells me as you take your photos during the ceremony. Can you show me the link to that part of your articles? Alfredo … the same techniques and principles would apply with the ceremony – whether in how you handle your camera and lenses; choice of settings; and use of light and possibly flash. The extra considerations are now timing and observation. Looking for key moments .. and still being stealthy. Alfredo .. you’ll be happy to hear about the new article on using flash during the wedding ceremony in the church. Hi Neil, in the big cavernous churches with wood panelling where you’re forced to use a diffuser cup, how are you then aiming your flash? I get much nicer light if the flash head is pointing straight up with the cup on rather than aimed straight at my subjects. But you do lose a lot of light and the flash struggles to freeze the movement in the processional: I’m not getting high enough shutter speeds even at 2500 ISO on my 5DII. Any tips? Many thanks. Catherine .. when I use a diffuser cup in this situation, I usually have my flash in a tilted-forward bounce position. It isn’t necessarily to bounce my flash around the place … but rather to force light fall-off in the foreground. If my flash was pointing straight forward, then the ground right in front of me would be brightly lit. (You’ve probably noticed this already.) Instead then, I tilt my flash up (or, if you want, tilted forward from the upright position), so that the ground in front of me receives about the same amount of light as my subjects. So it really is about feathering the light. I hope this makes sense. re the choice of shutter speeds. In this situation, you are letting your flash take care of proper exposure. So your ambient will be under-exposed to an extent. So you can push your shutter speed up a bit to where you are comfortable that you won’t get subject movement. I realize this is primarily a discussion about indoor / flash photography, but do you have any recommendations about using fill flash when photography a wedding outdoors? Especially in bright sun ( assumimg overhead sun)? Or should one just shoot in existing light and worry about fill flash only if they are shaded? 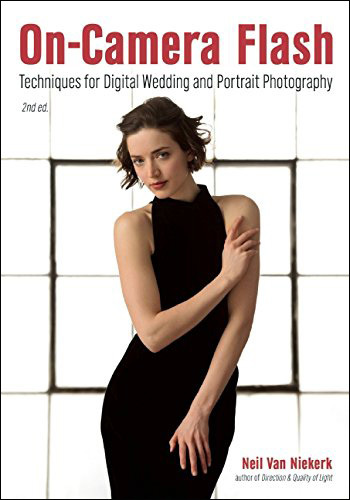 At the end of this page, there’s a link to more articles about wedding photography, and there you’ll find the link to the article on shooting wedding portraits in bright sunlight. Neil, a little off-topic, but are you shooting in Auto ISO while in Manual mode? I noticed that all three settings (Shutter, Aperture and ISO) changed quite often. I don’t know how one could concentrate on shooting while changing all of the settings from shot to shot. Never with auto ISO. For me, that would defeat the entire point of shooting in manual exposure mode, because it would bring in a variable again. I want manual exposure mode on my camera, because then my ambient exposure is fixed. Then, as a variable (if necessary), I can bring in TTL flash. 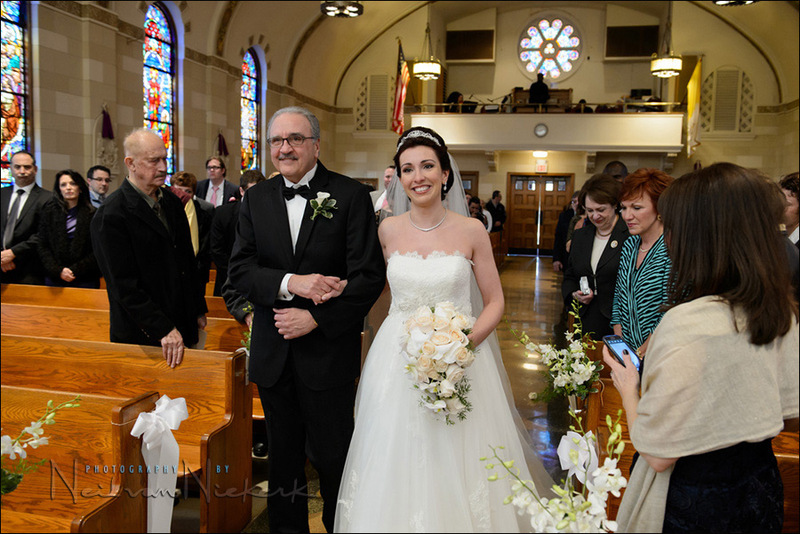 It’s been difficult for me to correctly set my exposure, because when they come down to the aisle, the church door are obviously large open and this cause that the background is always overexposed because of the lighting come in from the church door !!! I’m wondering how can i deal with that, and where i’m supose to be standing … In the middle of the aisle, on the side or in a bench place ??? Thank you and have a nice day !!! Jonathan, there isn’t much you can do about that background light blowing out like that, if you’re only using bounce flash. The bounce flash just isn’t strong enough. Direct flash on the other hand, usually looks pretty ugly. So I prefer to allow the background light to blow out. I don’t like standing at the front, because I feel it is intrusive, but this is usually where I land up. I’d prefer to be part-way down the aisle, in a pew. thank you for this precious technique you share. However, I still have 2 questions: 1. do you set then manually the zoom of the flash to maximum everytime when you use the piece of black foam? 2. what about the setting of the WB when you use the fluorescent gel? I usually zoom to the maximum when I bounce my flash like that. With fluorescent lighting, I normally use the 1/2 CTS, and try to dominate the ambient light with flash. Fluorescent lighting varies a LOT in color temperature. Fortunately, you don’t much get the sickly green industrial fluorescent lighting in offices and workplaces and public places. So you can just use flash with a gel for Incandescent light, such as the 1/2 CTS, and get away with it. I use a 430 ex II, and when I don’ t have anything to bounce it off, I use a little piece of card behind it as a diffuser, and it offers acceptable results, in landscape modes. But when comes the moment I have to use the portrait mode, especially in shorter focal lenghts, then I have no regular lights on my subjects (from right to left or vice versa), what do you propose to solve this. Njaka .. what you’re looking for is a flash bracket. Neil, in the processional, as a rough guide how many photographs do you take in succession in order to find the final shot? I try to get 2-3 shots of every bridesmaid coming down the aisle. I need more than one shot ideally because of blinks, etc. But I usually only select one image of each to give to my clients. i normally shoot with or without flash on AV with TTL. do you always shoot in Manual mode and why? It is the only way I have control over my ambient exposure, with consistency between images. Neil…. Thanks for sharing…. Quick question about lens choice for processionals. I own two cameras so I can only choose two. Which of these is best???? It gives me the best range when I work fairly close to people walking down the aisle. 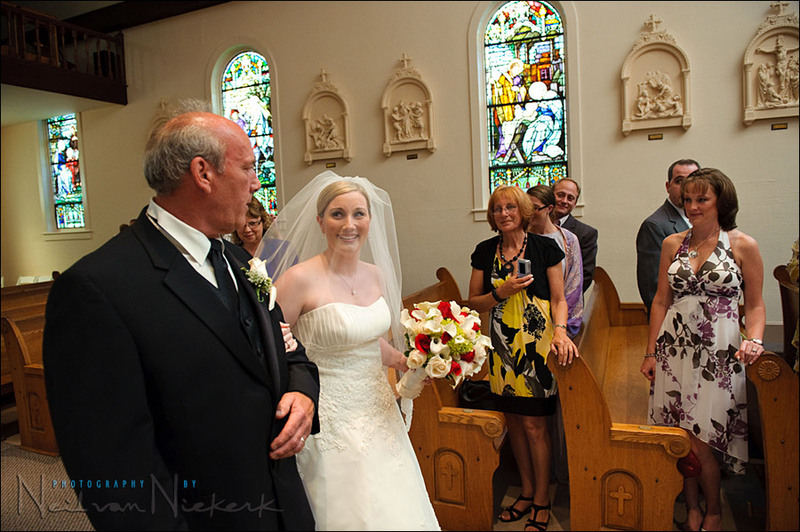 I do keep the 70-200mm f/2.8 on another body, to photograph the bride’s entrance into the church, if this is possible. It depends on the light and the distance. I have used the 85mm lens, but find the zooms more flexible. 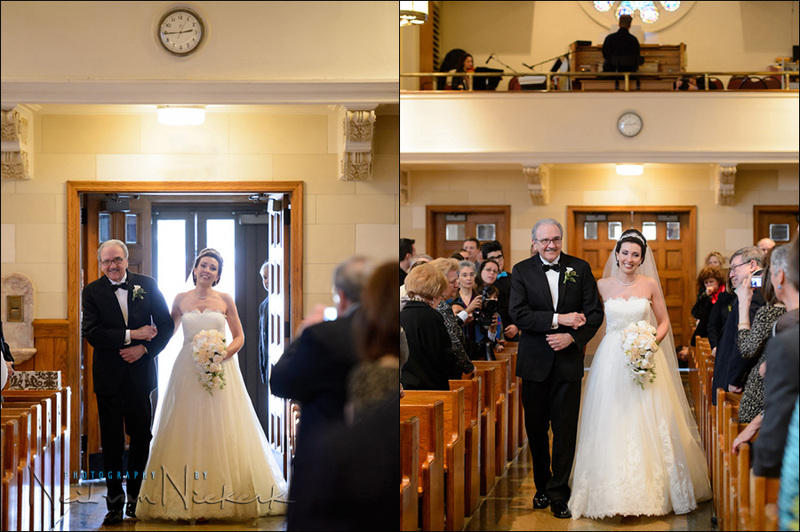 I’ve seen photos by other photographers who prefer working at a longer distance from people walking down the aisle, and these look great … but, as I said, I prefer to play it safe with a medium-range zoom. As for the fish-eye … it is my least used lens. I’m not fond of the look. Here are examples of how I switch it between the two cameras. Awesome advice!!!!! I, like you, like the closer images. More expression!!!!! Thanks so much for the input. Great pictures here. I shoot in AF-S / Single mode. But then again, I use the D3 / D3s / D4 line of cameras. They lock focus really quickly. I like Single / AF-S mode for this, because the flash emits the auto-focus assist beam. It doesn’t in Servo / AF-C. 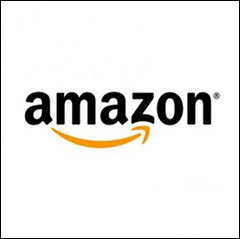 I just love your site, and your advice is worth it’s weight in gold! I have been reading this article over and over, a couple of question spring to mind if that’s ok? One is sometimes when I have bounced flash and the flash has had to travel quite a way I have seen ghosting on the image where the ambient is slightly out of synce from the flash exposure. I’m confused why this is happening in rooms smaller than the church in your article. Maybe my shutter speed needs to be higher than it was, not sure. During this time I assume you never drop below 1/100 due to movement towards you? And when you decide there is no way you can bounce am I right in saying you use a stofen diffuser at 45 degrees? I have a wedding in May where the venue has dark brown walls and maybe a slightly lighter ceiling very high up. Am I best using the 45 degree stofen method? 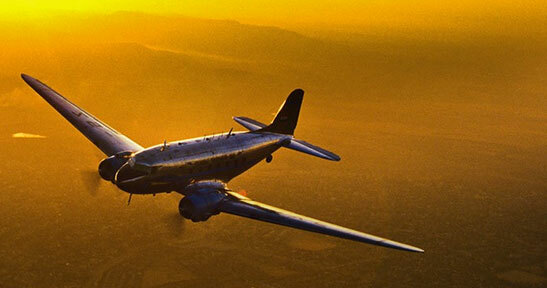 You’re correct – your shutter speed is too low in that case. The downside is, as you increase your shutter speed, your background is likely to go darker. What does help is how the inverse square law makes the background brighter when you bounce flash. And when you have nothing to bounce your flash off, and off-camera lighting isn’t possible, then yes, direct flash (with or without diffuser cup) is your most practical solution. I’d still drag the shutter then to bring in some of the available light. Oh just realised I has another question too! I’ll also be shooting at another venue with mixed lighting. One side of the ceremony room has natural light coming in and the rest of the dark room is lit by tungsten light, how would you attack this type of ceremony? Over power all the light with flash? If possible, add flash to the one side. Either as normal flash, or the other side as a gelled flash. This is really a tough scenario because you’re unlikely to get that much light in from your flash if the venue is large. Then there are two options – just go with it, because *this* is what it looked like … or go to B&W.